Quite the rain storm came through this weekend. Much needed in terms of local rainfall, but kind of awful if you do not have a roof on your house. And even more awful when you have stacks and stacks of drywall in your house. Is it bad to say I was a little relieved that it was not really my problem? I mean, it's my problem in that everything that happens to the house is my problem, but it wasn't in that there's a contractor here handling things like sending a guy out on a Sunday to fix the tarps on the roof. 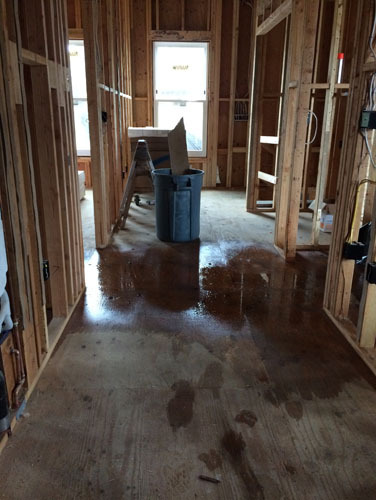 In the meantime, the reason we found out about this at all was that Noel lost his mind a little and decided to fix something the contractor thought could not be done. That's the floor of our coat closet, and that duct is the vent from the powder room, which runs down and out through the crawlspace. It has that weird jog because right under this floor is one of the seismic tie-downs that holds the front of the house to the back, so the duct obviously had to go around that. We went through many iterations of discussing how to bring it out the side of the house, but every time it ended up in the roof of the side porch and that just doesn't work (the laws of physics being against us on that one). But Noel disagreed that the vent could not be made to go straight up to the attic, as we had the flexible duct before. 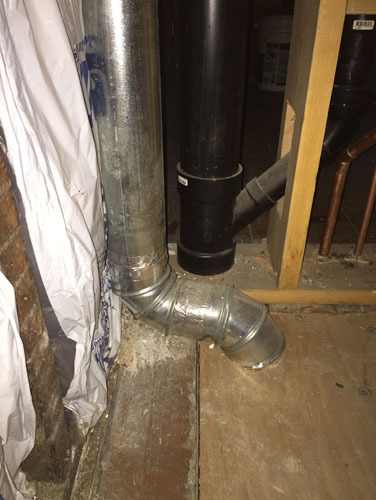 The issue here is that we had run flexible duct -- threaded with great pains through the area around the niche in the wall -- but the contractor has had pushback on using flexible duct and did not want to have that holding him up if it failed an inspection. So they removed it, but the rigid duct obviously could not follow the same path because that path was kind of insane. 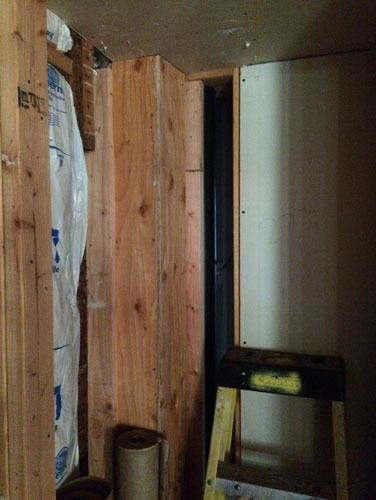 The contractor had offered this as a route, running through our closet and taking up quite a bit of space. I was not super happy about it, and Noel hated it. It took up space we would prefer to use for our excessive number of coats (seriously, two people, eighteen coats, why? what is wrong with us?? ), and more to the point, it was an ugly solution. So Noel told the contractor he was going to try to run the rigid duct up to the attic, and the contractor basically said, go ahead and try you crazy person, but in slightly nicer words. 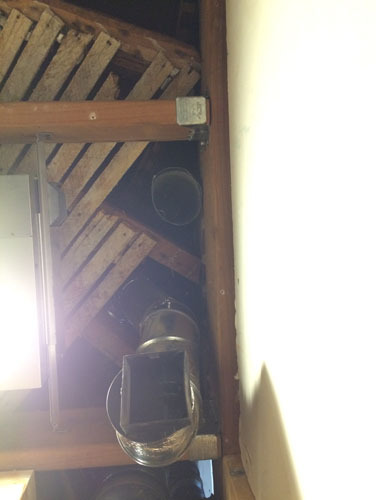 And Noel went to the house on Sunday and, after he made a few urgent phone calls about the rain cascading from attic to basement, he used willpower and stubbornness to run a rigid duct around the niche where it will be easy to connect it to the attic. I will be the first to admit that I did not think it could be done. I was totally wrong. And now we have room for all our coats, and maybe a few additional celebratory coats.